Northants spinner Graeme White has confirmed his retirement from red-ball cricket in order to focus exclusively on the shorter formats of the game. The 31-year-old is hoping the decision will help to prolong his playing career. White, who joined the Northants academy aged 14 back in 2001, has made a combined total of 39 first-class appearances for Northamptonshire and Nottinghamshire since 2006. He has scored 659 runs and claimed 65 wickets at 42.00 in the process, but he has played in only eight Championship matches during the past two seasons. Named the Royal London One-Day Cup’s player of the year in 2016, he underwent surgery on his shoulder last autumn. And White is now keen to ensure his sights are firmly set on staying injury free as he looks to help Northants claim more glory in the T20 competition this season. 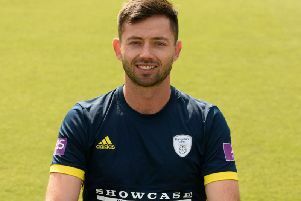 “I missed out on a lot of the T20 last year through injury (managing only four games in the competition) and I want to give myself the best possible chance of being able to play for Northamptonshire for as long as I can,’ White said. “I feel if I pack in the red-ball cricket it will give me a better opportunity of going well into my thirties and hopefully beyond. That was the thinking behind my decision. “Red ball isn’t my best format so this will give a chance for others to come through and I can concentrate on the shorter formats. “If you’re a regular in the side – as I have been in white-ball cricket – you get used to it and you enjoy it. "When you’re in and out of the team it’s not ideal, and I’d just had enough of it really. “I will miss the longer game because I’ve had some success and some great victories, both at Notts and Northants. But that’s the way it’s panned out.